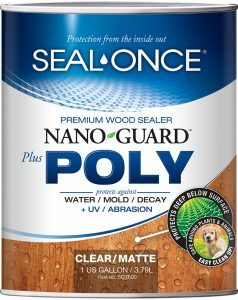 Seal-Once™ Nano Guard Plus Poly provides a revolutionary all-in-one product for all exterior and interior wood surfaces with long lasting protection, vibrant tints and eco-friendly waterproofing. Seal-Once™ Eco-Friendly Marine Waterproofer for Wood is a green stain/sealer product formulated for exterior use on properly prepared, unsealed wood surfaces. Seal-Once™ Marine is a high-performance, toxin-free, water-based waterproofer and wood sealer that provides long-lasting protection to all wood surfaces. 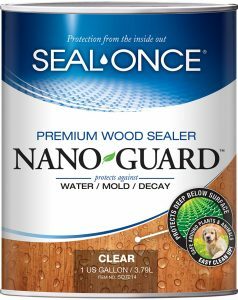 Seal-Once™ Nano Guard. The deep penetrating sealer and waterproofer for all wood surfaces including siding, decks, outdoor furniture, fences and log homes.